Supports Healthy Bladder Strength and Function for Men and Women! SagaPro®, by Terry Naturally®, is a proprietary, aqueous extract of Angelica archangelica leaves, harvested from wild plants grown in the pure air and soil of Iceland. 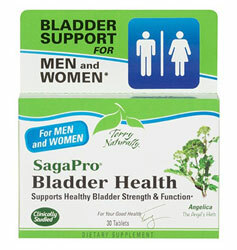 SagaPro® has been clinically studied to support bladder health and urinary frequency. For women, SagaPro® is ideal for healthy bladder strength. In recent clinical trials, participants reported improved sleep patterns as well. For men, SagaPro® is ideal for prostate as well as bladder health. Angelica archangelica contains key compounds that support the smooth muscle tissue of the bladder, making it ideal for both men and women. This prized botanical in Iceland has been used traditionally for over a 1,000 years. The angelica leaves used in this formula are gathered by local people in an eco-friendly manner. Although abundant in the fresh landscape of Iceland, wild angelica is still recognized as a valuable resource. While this plant is wild harvested, the procurement process is monitored and sustainable. Great Article: For a detailed explanation of how Angelica extract works to reduce urinary frequency, please click here. Ingredients: (per serving) Angelica (Angelica archangelica) Leaf Extract (aqueous solution) - 100 mg. Contains no sugar, salt, yeast, wheat, gluten, soy, dairy products, artificial coloring, artificial flavoring, or preservatives. Recommendations: 1 tablet daily; may increase to 2 if desired. When starting to use SagaPro it’s recommended to take 2 tablets daily for the first two or three days.